Image Galaxies and Nebulae with a DSLR and this portable tracking mount. The new Skywatcher Star Adventurer is suitable for those looking for an introduction into astrophotography using DSLR cameras with wide-field and medium focal length lenses. The user-friendly Sky-Watcher Star Adventurer provides various combinations to satisfy all you needs for astrophotography and time-lapse photography. It is a portable celestial tracking platform for sidereal, solar and lunar tracking with automatic DSLR shutter release control. Moreover, it contains pre-programmed parameters assisting you to create interesting time-lapse videos with your DSLR. 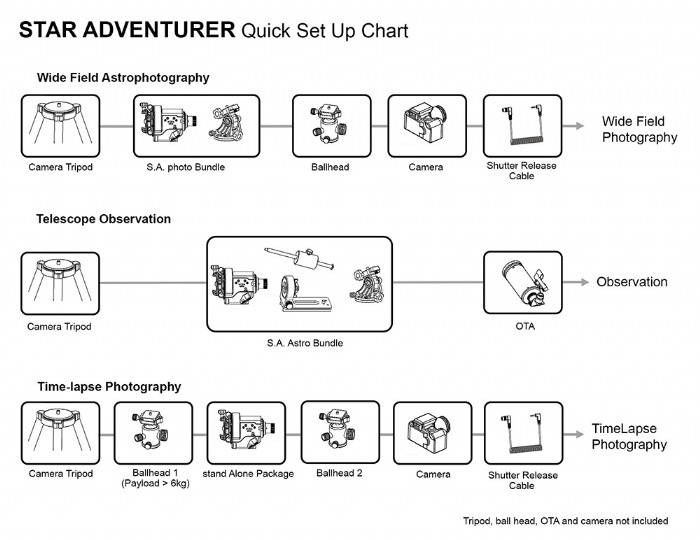 Star Adventurer Astro-Photo Bundle: includes the Star Adventurer Mount, Ball Head Adaptor, Illuminated Polar Scope, Dovetail L-Bracket, Equatorial Wedge and Counterweight Shaft with 1kg Counterweight. Sky-Watcher shutter release cables can be purchased separately for most popular camera models/brands. The Star Adventurer can attach to any standard tripod via its ¼” or 3/8” adaptors. The latitude can be set by either adjusting the tilt of your tripod head to match your latitude or more accurately with the included Equatorial Wedge. 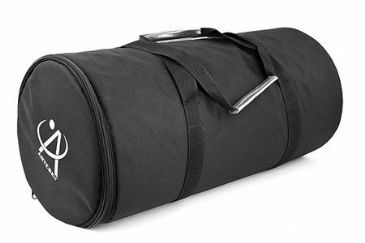 To fit a camera to the Star Adventurer, either a tripod Ball Head can be fitted (optional extra) or to the supplied Dovetail L-Bracket. The Dovetail L-Bracket used in conjunction with the supplied counterweight shaft/counterweight also allows small telescopes (e.g. Skymax-90), with a ¼-20 tripod fitting, to be used with the Star Adventurer. By dispensing with the counterweight shaft, a small telescope and camera (using a ball head, optional extra) can be mounted simultaneously on the Dovetail L-bracket. Using just the dovetail bar from the Dovetail L-Bracket, two cameras can be mounted at the same time using two tripod ball heads (optional extras). Tracking Modes Sidereal, Solar or Lunar tracking rate for both North & South hemispheres. Made in Italy from tough quality material.